In the latest update to Adobe Premiere Pro CC, Adobe has integrated a far more advanced graphics panel in Premiere Pro turning it into a software not only for video editing, but for motion graphics as well. And to add to this update, this month, Envato Market announced a new collection of visually compelling Adobe Premiere Pro CC templates to their VideoHive marketplace, including lower-thirds, transitions, social media captions and more! The Premiere Pro CC templates from VideoHive require not much experience and they are designed to speed up your workflow! So why use Adobe Premiere Pro CC Templates? 1. Premiere Pro CC Templates are Smart Shortcuts! 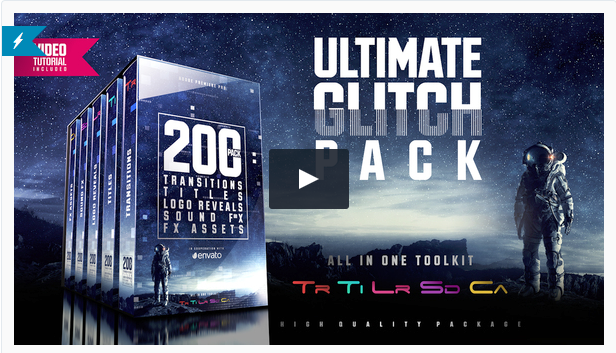 Example of a VideoHive Glitch Premiere Pro transition pack. Click to preview template pack. 2. Buying templates are supporting editors and artists. Every template you buy is benefiting the video editors and motion graphic artists who make a living creating templates to sell. 3. They are opportunities to grow and learn! Working with templates can help teach you how to organize and create your own effects. 4. They use the latest technology. 6. .MOGRTS are more advanced! Most motion graphics templates (.mogrts) are designed in After Effects CC. So you are able to import more complex templates than you would be able to create in Premiere Pro. You can also open .MOGRTs in After Effects if you want to update the font, follow this tutorial as it requires a special work around not many know of. Let me know if you have any questions. Drop me a line and I'll be happy to answer! Envato Market is a creative marketplace with a variety of video creation assets that includes Premiere Pro templates, After Effects Templates, stock music, sound fx, and stock video.